Seattle, WA : YWAM, 2011, c1998. After stunning the world with his refusal to run in the 100-meter Olympic race on a Sunday, Eric Liddell won the 400-meter race in an incredible victory and later became a missionary to China. Eric Liddell: Something Greater Than Gold. 100 Personl Name ME 1 $a Personal name Benge, Janet & Geoff. 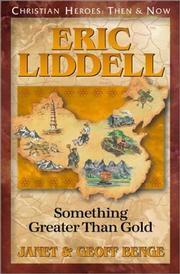 245 Title 0 $a Title Eric Liddell: Something Greater Than Gold. $c Date of publication, dist, etc 2011, c1998. $b Other physical details illus. 520 Summary Etc. $a Summary, etc. note After stunning the world with his refusal to run in the 100-meter Olympic race on a Sunday, Eric Liddell won the 400-meter race in an incredible victory and later became a missionary to China. 650 Subj:Topic 4 $a Source other than LC LIDDELL, ERIC (MISSIONARY)--BIOGRAPHY.